We recently held two really enjoyable Tenant Forums – one in Preston and the other in Kendal for our Cumbrian tenants. It was great to see so many new and familiar faces, especially on one of the hottest days of the year! 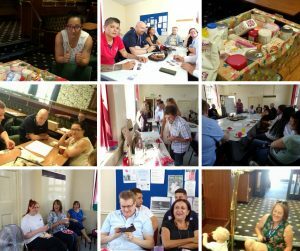 In Preston, tenants were treated to homemade cake and flapjack while they listened to visiting speakers from Lancashire Fire, Preston’s College and local women’s and eating disorder charities. Sarah Despard won a fantastic hamper, generously donated by Tesco in Chorley, and Shelby Gayther won a voucher in our prize draw. Up in Kendal, tenants enjoyed lunch and a chat together, took part in a fun (very competitive!) general knowledge quiz and gave us some valuable feedback. Many tenants won a prize on the tombola before heading off into the sunshine. Thanks to all who came along and to everyone who helped organise. See you at the next one!